Facial tissues belong to a class of paper products used extensively for personal hygiene in modern society. Other products of this type include paper towels, napkins, and sanitary (or toilet) tissue. These products are designed to be highly absorbent, soft, and flexible. These pleasant tactile properties are especially important for facial and bathroom tissues, considering their use. To optimize pleasant skin feel, tissues have been developed with softening agents or lotion-type ingredients to reduce any chafing effect on delicate parts of the body. Tissues of this type are made by a process in which the nonwoven fabric is made from a solution of cellulose fibers and water, formed into a sheet, then coated with softening agents. Finally, the coated fabric is cut into individual tissues, folded, and packaged for sale. Tissue softness is a tactile perception characterized by the sheet's physical properties, such as flexibility or stiffness, texture, and frictional properties. Historically it has been difficult to soften the tissue surface without interfering with other properties of the fabric. For example, softness can be increased by adding agents that interfere with the way the fibers within the tissue interact, making them less closely bonded to each other. These are known as debonding agents. However, these materials tend to decrease the tensile strength of the fabric and may irritate skin on contact. Enhanced softness can also be achieved by coating the fabric with oily materials. However, this limits the amount of moisture the tissue can absorb. In fact, the coating can also make the fabric so hydrophobic (water hating) that it can not be processed properly in sewage plants. Another problem is that some coating materials may decrease the strength of the fabric to the point where the tissue is not usable. To overcome this problem, fabric strength may be increased by adding certain resins or by mechanical processes which ensure the fibers bond together better. However, increasing strength tends to make the fabric stiffer and harsher to the touch. Rising to these challenges, tissue manufacturers have designed methods that successfully balance softness with absorbency and strength to create a product that consumers find acceptable. Tissue paper is a nonwoven fabric made from cellulosic fiber pulp. Common fibers used in tissue paper pulp include wood (from either deciduous or coniferous trees), rayon, bagasse (a type of sugar cane stalk), and recycled paper. These fibers are macerated in a machine known as a hydropulper, which is a cylindrical tank with a rapidly revolving rotor at the bottom that breaks fiber bundles apart. In this process the fibers are mixed in a cooking liquor with water and either calcium, magnesium, ammonia, or sodium bisulfite. This mixture is cooked into a viscous slurry containing about 0.5% solids on the basis of weight. Bleaching agents are added to this mixture to whiten and brighten the pulp. Common bleaching agents include chlorine, peroxides, or hydrosulfites. The pulp is then washed and filtered multiple times until it is the fibers are completely free from contaminants. This mixture of pulp and water, known as a "furnish," is then ready for the papermaking process. Softening agents are oily or waxy materials that are coated onto the tissue fabric to improve its tactile properties. These materials are too concentrated to coat directly on the paper, so they must be diluted with water first. However, these oils do not dissolve in water, they must be dispersed in water with the aid of chemicals known as surface active agents, or surfactants. A mixture of water, oils, and a surfactant is known as an emulsion. Mayonnaise is an example of a food product emulsion. The oily materials used in lotions typically include vegetable and mineral oil, plant or animal derived waxes, fatty materials, and silicone-based oils. While theoretically all of these materials would be appropriate tissue paper softening agents, experience has shown that many of them do not function well because they interfere with other desirable properties of the paper, like its absorbency. The tissue industry has had to develop its own patented combinations of lotion materials which, when blended and applied in the correct ratio, provide appropriate softening without negatively affecting the tissue. These materials include polyhydroxy compounds with multiple oxygen-hydrogen groups that allow them to interact with water. Therefore, these compounds are able to soften the paper surface without blocking too much water. Examples of polyhhydroxy compounds include glycerine, propylene glycol, polyoxyethlyne glycol, and polyoxypropylene glycol. They are employed at concentrations between 0.1 and 1% on the basis of the dry tissue weight. Other useful agents include mixtures of petroleum- and silicone-based oils, which are judiciously added to further soften the paper. These oils must be used at low levels to avoid waterproofing the web and robbing it of absorbency. Surfactants are added to disperse the oils in water. A typical surfactant used in paper treatment emulsions is cetyl alcohol, a fatty material whose chemical structure allows it to combine oil and water. A variety of specialized equipment is used to press the pulp mixture, or furnish, into a nonwoven sheet of fabric-like paper. Nonwoven fabrics are different from traditional fabrics because of the way they are made. Traditional fabrics are made by weaving fibers together to create an interlocking network of fiber loops. Nonwovens are assembled by mechanically, chemically, or thermally interlocking the fibers. There are two primary methods of assembling nonwovens, the wet laid process and the dry laid process. The wet laid process is employed for making the type of nonwoven used in tissue production. 1 The slurry flows into a device known as a headbox, which in turn spreads it on a moving wire mesh known as a Fourdrinier. The Fourdrinier is a continuous wire belt, approximately 50 feet (15 m) or more in length, which is stretched out like a table. As the fibers are travel down this belt much of the water drains through the holes in the wire mesh. The wet sheet of fibers is carried by a series of woolen blankets, called felts, between several sets of rolls, which further compress it and remove more water. At this point the sheet is strong enough to be transferred to a drying machine that is especially adapted for making tissue papers. 2 The tissue paper drier is called a Yankee Dryer and consists of a steam-heated, highly polished roller 10-12 feet (3-4 m) in diameter. The wet sheet is carried by a heavy canvas felt, which is threaded over and around the rollers. With each successive pass, the rollers remove more water until the paper is adequately dried. If desired, a pattern may be imprinted in the tissue by juxtaposing the web on an array of supports during the dewatering process. (Alternately, the web can be dewatered and transferred to a separate imprinting line.) The raised supports on the line create bumps and valleys on the fabric. These are regions of varying fiber density and are visible as tiny patterned "pillows" on the final sheet. If necessary, these high bulk areas can be densified even further by applying a vacuum to selected portions of the sheet. After the fabric been compressed to the desired thickness, it is referred to as a "web." The web is now ready for additional processing. It may be coated or stored on large vertical rollers, known as calendar stacks, to await further operations. 3 The lotion is prepared in steam-heated batch tanks equipped with high speed mixing blades. The oils and water may be preheated and are blended together with high shear to form an emulsion. The completed lotion is ready to be applied to the paper surface and is pumped from the batch tanks to a holding vessel connected to the coating equipment. 4 The nonwoven web is fed onto a series of papermaking belts. As it travels over the belts the web comes into contact with an emulsion distributing roller, which pulls lotion out of the holding tank and coats a thin film onto the web. Ideally low amounts of lotion are applied (0.3% or less) to prevent the web from being overcoated. However, higher levels can be used if the coating is designed with additional surfactants that will act as wetting agents to help the tissue absorb moisture through its hydrophobic layer. After passing through the coating rollers, the web continues along the belts to other rollers, which strip excess lotion from the fabric. In between processes the belts are kept clean by belt-cleaning showers that remove paper fibers, adhesives, and other additives. 5 The web passes through a series of rotating knives that cut it to the desired width. The coated tissue is then sliced at tissue-sized intervals, folded, and packaged in boxes or cellophane wrap. The tissue manufacturing and coating process generates considerable amounts of waste material, but much of this is reclaimable. Waste fibers from the pulping process can be washed and reused. The water used in the slurry and in subsequent operations can be recycled. Unfortunately, there is little or no recovery of the chemicals used in coating and other treatments, and the disposal of the various spent solutions is a problem for the industry. There are many quality control measures used in the tissue paper industry. The ones related to lotion application include analytical testing and subjective panel evaluations. Since the amount of material deposited on the tissue is critical, the industry has established various tests to measure how much is actually present on the tissue surface. For example, the amount of polyhydroxy compounds present can be determined by stripping the compounds from a tissue sample using a method known as the Webul solvent extraction. The amount of compound is then measured on a spectroscope or chromatograph. The concentration of surfactants can be established in a similar manner. While these analytical techniques can precisely determine the levels of specific chemicals, they can not evaluate fabric softness. This tactile property is assessed by subjective evaluation by trained panelists. Prior to these evaluations, the tissue fabric is equilibrated to a constant temperature of 72-111°F (22-44°C) and relative humidity of 10-35%. The fabric is then conditioned for another 24 hours at 50% humidity. Panelists are then asked to feel swatches and rate the degree of softness, flexibility, and smoothness. The evaluation is done by paired comparison, as described by the American Society for Testing Materials (ASTM). Subjects are presented with samples on a blind basis and required to choose one on the basis of tactile softness. The results are reported in Panel Score Units which grade the fabric on a scale of "Much Softer," "Slightly Softer," "Equally Soft," "Less Soft," etc. Absorbency, the ability of the tissue to be wetted with water, is quantified by measuring the period of time required for dry tissue to become completely saturated with water. This measurement is known as wetting time. Once again, the fabric is equilibrated to a specified temperature and humidity. It is then cut into small squares, crumpled into a ball, and placed on surface of a 3-qt (3-1) beaker of water. A timer is started when the ball hits the water and the amount of time for the ball to be completely wetted by the water is measured. Five sets of five balls are tested to obtain an average measurement. Absorbency is measured on fresh tissue samples immediately after manufacture and on samples aged at least two weeks. This is important because absorbency will decrease over time, as the coating agents cure on the surface of the tissue. The density of the tissue is also measured with a thickness tester to evaluate how thick cloth is, then its mass, volume, and area are calculated. 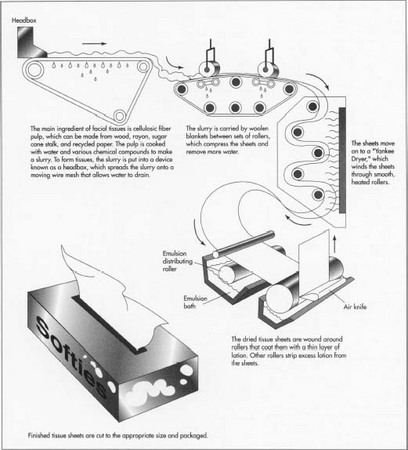 Linting (the amount of loose lint which detaches from the tissue) is measured by abrading a sample against a piece of black wool by a motor driven device known as the Sutherland Rub Tester. Colormetric analysis can then be used to determine the quantity of lint transferred to the wool. The increased environmental concern about waste chemicals may lead to improved lotion formulations employing biodegradable or recyclable raw materials in the future. The industry is continually researching ways to make the manufacturing process faster and more energy efficient. Finally, methods may be developed to improve the strength of nonwoven fabrics without sacrificing the pleasant tactile characteristics that make lotion-coated tissues so desirable. Ingman, Lars C. "Accepting 'The New.' (new products and techniques in the paper industry)" Pulp & Paper, 62, no. 5 (May 1988): 127(2). "Nonwovens: making a better product," (International Textile Machinery Association) Textile World 141, no. 12 (Dec 1991):63(4). "TAPPI brings librarians and paper industry together." (Technical Association for the Pulp and Paper Industry), Library Journal 113, no. 20 (Dec 1988):35(1). "Pulping conference focus is energy conservation, process optimization." Pulp & Paper 55 (Dec 1981):108(3). I would be highly appreciate if you can kindly suggest us the formulation of the wet tissue dipping and packaging.